‘Kimigayo’ commemorative postcard, c. 1910. “An entirely different sense of the meaning of ‘Kimigayo’ in contemporary Japan was encountered at a rock concert I attended in July 2003 at the Zozoji temple in downtown Tokyo. Thousands of young Japanese flocked to this free concert featuring Imawano Kiyoshiro, former lead vocalist of R.C. Succession, which was among Japan’s most influential bands of the 1970s and 80s. At the concert, Iwamano performed numerous American rock ‘covers’ from the 1960s and 70s, using his own Japanese translations of the English words as lyrics. From the wiki: “From 1868 to 1945, ‘Kimigayo’ served as the national anthem of the Empire of Japan. With a length of 11 measures and 32 characters, ‘Kimigayo‘ is also one of the world’s shortest national anthems currently in use. While the title ‘Kimigayo’ is usually translated as ‘His Majesty’s Reign’, no official translation of the title nor lyrics has ever been established by law. “In 1880, the Ministry of the Imperial Household adopted a new melody composed by Yoshiisa Oku and Akimori Hayashi. Although the melody is based on a traditional mode of Japanese court music, it is composed in a mixed style influenced by Western hymns, and uses some elements of the original Fenton arrangement. German musician Franz Eckert arranged the melody with Western style harmony, creating this second, current version of ‘Kimigayo’. 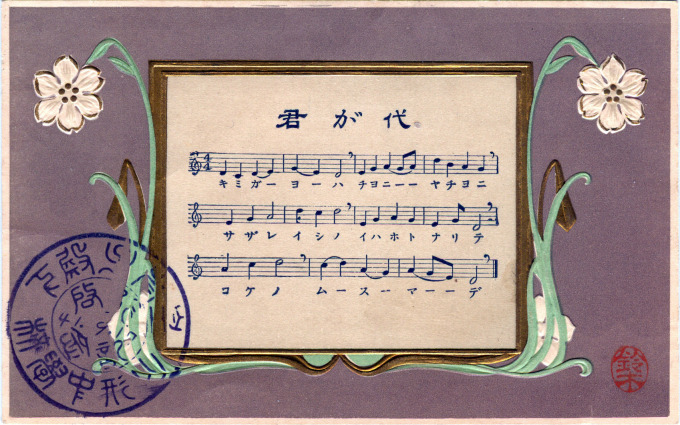 The government formally adopted ‘Kimigayo’ as the national anthem in 1888 and had copies of the music and lyrics sent overseas for diplomatic ceremonies. “The lyrics to ‘Kimigayo’ first appeared in the Kokin Wakashū, a poetry anthology from the Heian period (794-1185). The poem was used in a later period as a celebration song of a long life by people of all social statures. “Following Japan’s defeat in 1945, during the American occupation of Japan, there were no directives by the Supreme Commander for the Allied Powers to restrict the use of ‘Kimigayo’ by the Japanese government, in stark contrast to the regulations issued restricting the use of the Asahi (Rising Sun) flag.